(a) Check if there is any foreign matter caught between the display and exterior frame of the multi-display. No foreign matter is caught between the display and exterior frame of the multi-display. If there is foreign matter between the display and exterior frame of the multi-display, the touch panel will remain pressed, preventing touch switch operation. (a) Check for foreign matter on the display. 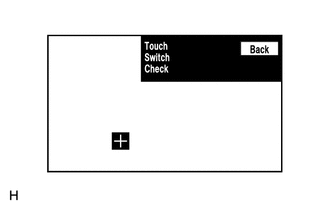 (a) Enter the "Touch Switch Check" screen. Refer to Check Touch Switch in Operation Check (See page ). (b) Touch the display in the area where the switch malfunction occurs. A "+" mark appears at the touched position.